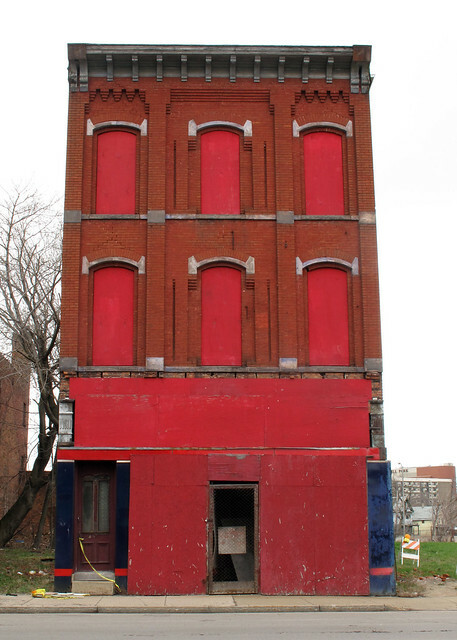 Demolition approval for 41 and 43 Spruce Street (bing map) was on the Preservation Board's agenda yesterday. The board unanimously denied the request. The First German Baptist Church was built in 1869. The structure appears to be in good condition. Some bricks on the bell tower need to be re-pointed, a rear brick shed needs attention. Roof damage behind the bell tower became a hole at some point during the winter. Next door, the parsonage sits straight and appears to be in good structural condition. Here's a side view. 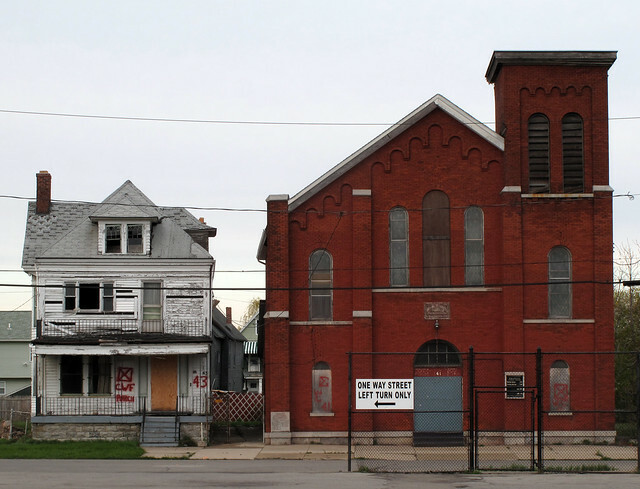 It's been reported that the current owner - Trinity Baptist Church located at 2930 Bailey Avenue in Buffalo, NY - has no plan for the church and adjacent parsonage as they no longer have the funds to maintain the property. In July 2008 they plead guilty to a number of Housing Court Violations involving two concurrent cases (#'s 635/2008 & 1319/2008). Part of the plea deal involves paying for a private demolition of 41 & 43 Spruce Street, the church religious structures they left behind. Declining neighborhood churches such as the Spruce Street Church exist all over the City, especially on the East Side. While larger religious structures such as Transfiguration Church crumble and strikingly significant parts of the City's cultural and religious life such as St. Gerard's are prepped for dismemberment and shipment South - support for the Spruce Street Church, a totally scalable project, remains silent. So, what should be done? Is it too late? Spruce Street is steps from an emerging downtown housing market. Should this church be sent off in pieces to the landfill or re-purposed and become one of the City's coolest new loft conversion projects? Update - 5/3/10 - Buffalo Rising posted about the Spruce Street Church. Students from the MIT School of Architecture + Planning have been visiting Buffalo, NY this semester. Working with Brent Ryan, whose work focuses on urban revitalization of older cities, students have created the following site - Shrinking City @MIT - Buffalo Studio. The site is dynamic and full of amazing illustrations. 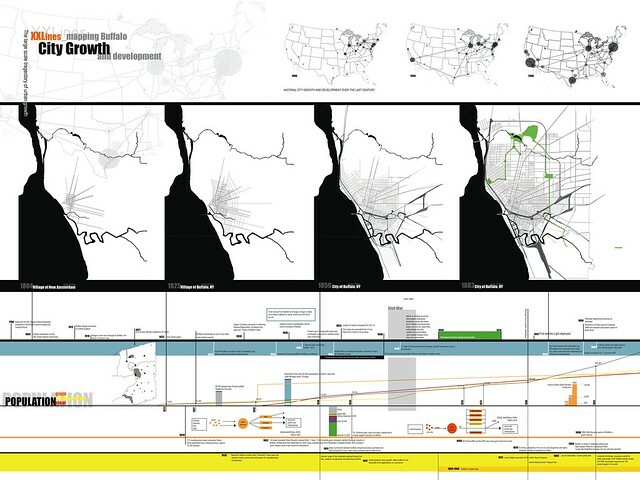 The Spring 2010 Shrinking Cities Buffalo studio is the first of a series of urban design studios that will propose comprehensive spatial strategies for shrinking cities. The studio examines the paradigmatic shrinking city of Buffalo, NY (1950 population 580,000, current population 270,000.) The city is well known as a historic innovator in architectural and urban design, with extensive work from Olmsted, Wright, Sullivan, Richardson, Burnham, and SOM as well as the concrete grain elevators made famous in Corbusier’s Vers Une Architecture of 1924. Buffalo has always been dependent on marine infrastructure: the Erie Canal of 1825 effectively started the city’s growth, and the St. Lawrence Seaway of 1959 categorically ended it. Buffalo today is faced with a myriad of crises. The current housing bust is only the latest in a series of events that seem to have conspired against the city. Among these are long-term economic decline stemming from economic-infrastructural shifts such as the Seaway; the suburbanization of the middle class; the nationwide shift toward the warmer Sunbelt cities; racial polarization and segregation; and globalization. The negative effects of these forces are clear to any visitor. 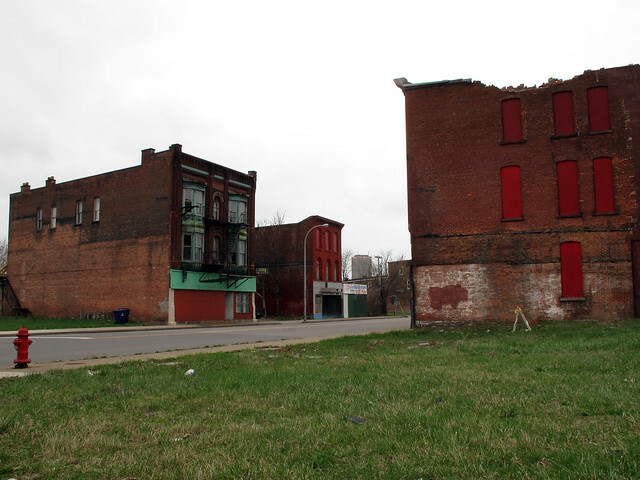 The city’s population has fallen dramatically and housing abandonment is a serious problem in the most distressed areas of the city. Despite these problems, Buffalonians have retained a sense of optimism toward the future. The city has inherited an impressive legacy of institutions from its past, and its design heritage is particularly strong. Buffalo’s amenities are spectacular for its size, and costs of living are low. Residents are friendly, approachable, and eager to discuss new ideas. The city’s industrial character is gritty and appealing, giving it a unique local flavor in an increasingly homogenized, chain-dominated, auto-dependent nation. The city’s political and social leadership is dedicated to making Buffalo livable under difficult circumstances that will not ease up any time soon. What is the role for urban design given this situation? The studio attempts to answer this question. Thinking about these issues and attracting some of the sharpest young minds to help manage and shape urban policy is critically important. The material generated from the SA+P studio will no doubt become an important part of the dialog here. I read Buffalo Rising's piece about the Central Park Plaza the other day. I haven't been there for 15 years. I went there yesterday. I took some pics. I was devastated. Wide open and shattered store front windows were everywhere to be found. The landscape here is beyond bleak, almost apocalyptic. Here's the same pics in a short Central Park Plaza slide show and a bing map for wayfinding. Over on Wilson Street, the urban agricultural movement in Buffalo, NY is beginning to blossom and the Stevens family is at the leading edge of this development at the Wilson Street Urban Farm. What better place to set-up of your own urban homestead? 396 Wilson Street (google map) showed up in the City's real estate catalog recently. It's a five bedroom single-family house. There's no basement, the interior has been trashed. The structure sits straight, it's stable and there's no interior water damage - the roof looks good. Basic rehab - your own labor - would probably run between 20-30k. It's a simple cottage. 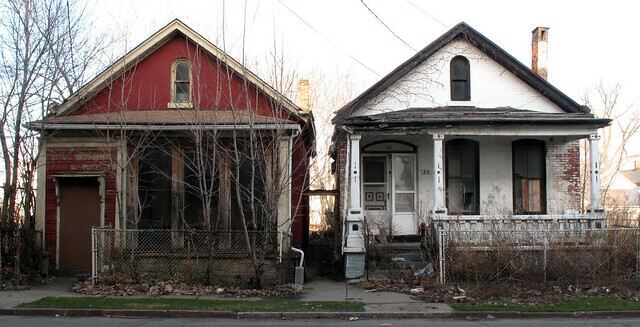 The real good news is that if you're interested the City of Buffalo will sell 396 Wilson Street for $1. Your neighbors - the Stevens Family, the community they're building and the City's Common Council President lives less than 100' away on Fillmore Avenue. If you're interested and start the acquisition process soon, you could be all settled in by the Harvest Moon. John Hannon, Director of Real Estate, is waiting to hear from you. The City's Division of Real Estate can be reached at (716) 851-5261. 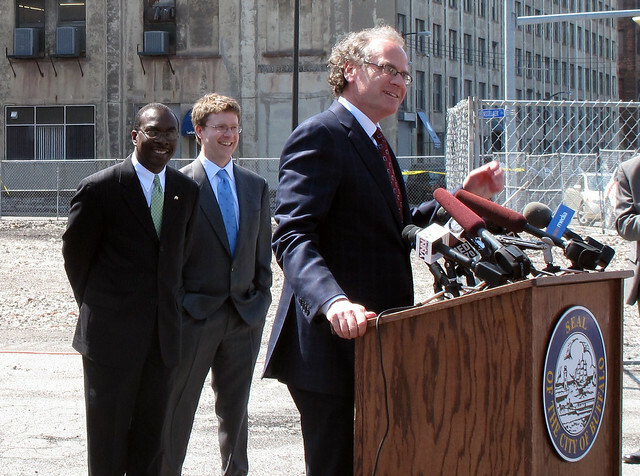 Anthony Armstrong over at LISC-Buffalo has been keeping track of Buffalo's decline, forever. He passed along the following wiki - Buffalo Vacancy - where he's been keeping track of the Buffalo data compiled by HUD and the United States Postal Service. Some staggering numbers. Click, download and take a look at the spread sheets Anthony has compiled and see for yourself. On a related note - Laura Underhill, a grad student in Landscape Architecture at North Carolina State, has been looking at a similar data set. Here - as part of a finals project - she's provided the following short flash video involving vacant land in this Cold Springs neighborhood (Main/33 - Ferry/Dodge). By this time next year the results of the 2010 Census will be available. Enter your best guess of where Buffalo will end up in the comments section, if you want. 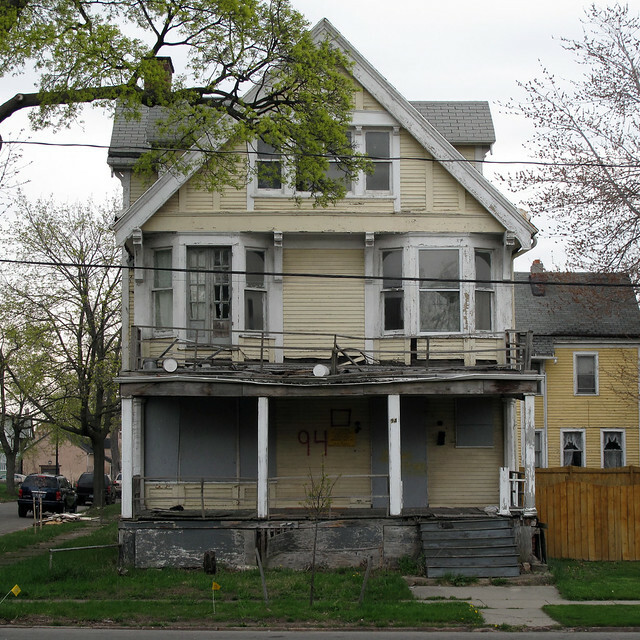 Late this afternoon Commissioner Jim Comerford from the City of Buffalo Department of Permits & Inspections informed me that 94 Northampton has been removed from the City's demolition list. John Hannon, the City's Director of Real Estate, informed me he's requested the Common Council add 94 Northampton to the list of City-owned property that is "homestead eligible." This means that 94 Northampton will be available - to a qualified buyer - for $1. 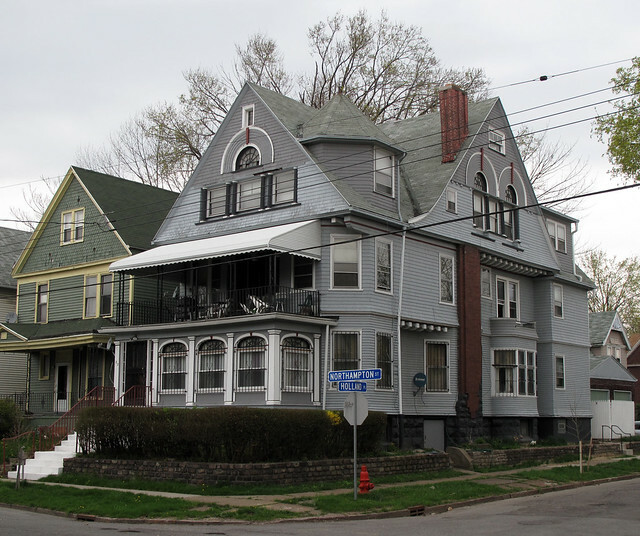 Ellicott District Councilman Curtis Haynes will be working along side Tim Tielman and the Campaign for Greater Buffalo, neighbors and other interested individuals and groups to find a buyer for this historic and architecturally significant Midtown Buffalo residence. City-owned 204 High Street is still available (bing map). It's located directly across the street from the new Kaleida/UB complex. While doing property research today, I stumbled upon the newly revised Erie County GIS system. It's now streamlined and user friendly and a welcome addition to understanding Buffalo's built environment. An on-line tutorial will walk you through some of the more advanced functions. The site works very well for mapping the rest of the county, in case you didn't know. Salvage crews from Buffalo ReUse were gutting City-owned 94 Northampton Street late last week (bing map). The City recently awarded a $20,900 contract for the demolition of this amazing Midtown residence to a local demolition contractor. The stewardship of 94 Northampton has been systematically mis-managed. It was flipped to MBBA - see Artvoice editor Geoff Kelly's MBBA analysis (2006) - and unceremoniously given back to the City. Inexplicably, the Preservation Board signed off on this demolition in 2006. Across the street three houses have been completely rehabbed. Anchored by Artspace and the Packard the neighborhood is no longer on life support. 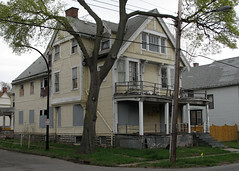 In 2007 the Landmark Society began advocating for the preservation of 94 Northampton. Located in the Artspace impact area this house was widely seen as a strategic save, a significant residence that was going to be part of this neighborhood's long term success. 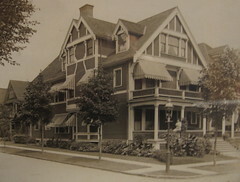 This house is located at 82 Northampton, right across the street. There are dozens of well-maintained houses in the neighborhood. All of these houses can be found within a block of 94 Northampton. By any measure the collection of 19th century architecture in this neighborhood would qualify as an historic district. This was the first house in the neighborhood to sell after Artspace announced plans in early 2006 to locate here. Neighbors say Buffalo ReUse left behind this mess along the curb after ransacking the historic 94 Northampton of salvageable materials. So, where's the plan? This is one of the East Side's most significant residential streets. There's a systematic failure here. Once 94 Northampton is demolished, it's gone forever. 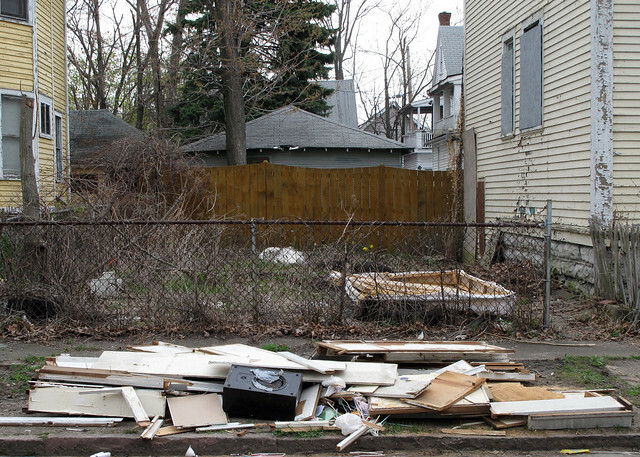 Genesee Street and emergency demolitions go hand in hand. 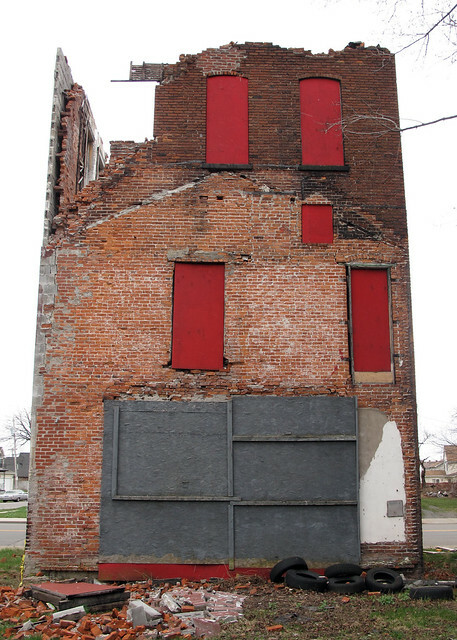 340 Genesee (bing map) is collapsing and only a stiff wind is standing in the way of another example of Buffalo's amazing vernacular commercial architecture from heading to the landfill. The roof collapsed into the building recently and crashed through to the first floor. Students from the two neighborhood charter schools were walking by the other day and were unaware of the building's condition. Fifty years ago - before the Kensington was built - the neighbor was dense and vibrant. Historic Aerials has the neighborhood from back in the day, here. Click on 'compare', select the year and slide the map tool over the area. The same corporation that owns 340 Genesee Street (Cherry-Hickory Inc.) owns 333 Genesee - another building with a big fat hole in the roof - according to the image generated from that same bing map link. 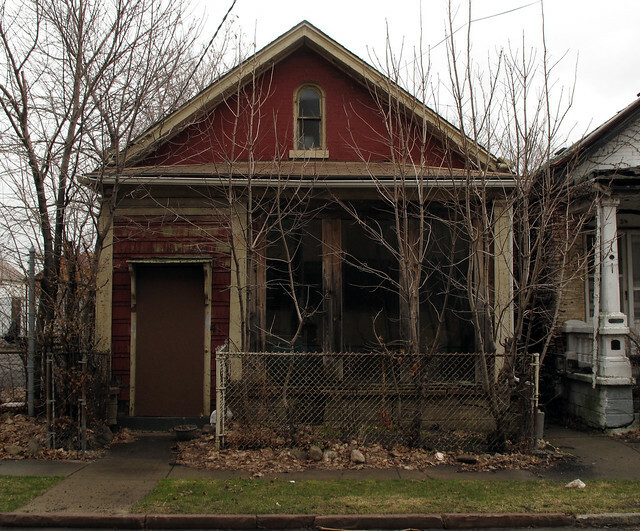 A Civil War-era cottage in downtown Buffalo is now available for purchase. The asking price? $1. 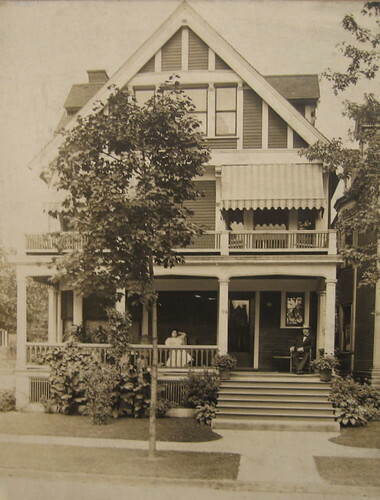 The cottage at 41 Milnor (google map) is an eight-minute walk to Lafayette Square and is eligible for the National Register of Historic Places, providing significant tax benefits for a new owner. Over 700 new loft units have been built in downtown Buffalo recently - see Buffalo Rising post - and the availability of this historic Italianate cottage for $1 is proof that it is still possible to find real values in the downtown housing market. There are two brick cottages that remain on Milnor Street. The City took possession of both cottages in 2007. Today the neighborhood is thinned out and a comparison - 1959 v 2006 - from Historic Aerials reveals the former density of the cottage community on Milnor. 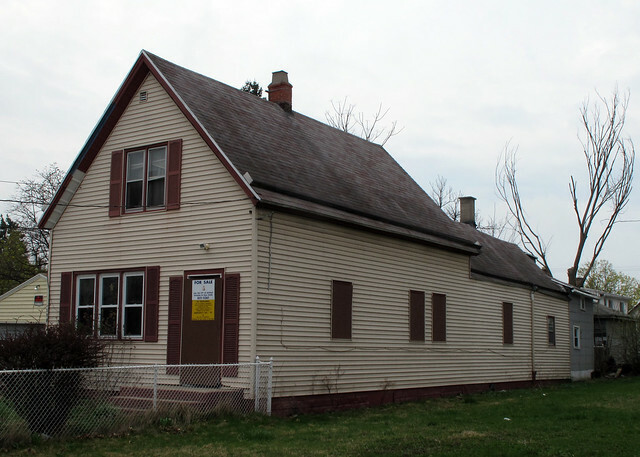 39 Milnor - the white cottage - is in rough shape. 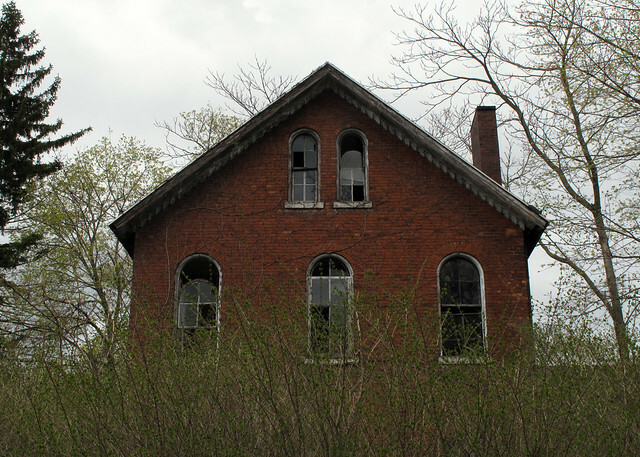 41 Milnor needs a lot of work, but it is a straightforward rehab. The cottage has a lot of integrity. If you don't save 41 Milnor Street, who will?